On the 1st of July, the duo Matmos (Drew Daniel and M.C. Schmidt) presented a lecture at Goldsmiths, entitled “What Is a Sound Object?” (http://www.gold.ac.uk/calendar/?id=8851). They went back to Pierre Schaeffer’s notion of “objet sonore” to discuss their approach to sampling, driven by the exploration of specific and meaningful sonic sources. The duo is also influenced by Timothy Morton’s theories, and they also discussed his notion of “hyper object” – an object that transcends “spatiotemporal specificity”, such as global warming. Matmos explore the connection between the sample and the original sound source, together with the meaning that emanates from it, but are adaptable to deviations from a strict conceptual angle. In an approach that the duo categorize as “pop”, they want to seduce the listener by creating resonant, challenging yet appealing sonic combinations. As example, they played the song “Germs Burn For Darby Crash” from the album “The Rose Has Teeth In The Mouth Of A Beast”. The basis of the song, a tribute to Germs vocalist Darby Crash, was the “Germs Burn ritual”, where fans of the band were “branded” with a cigarette burn by a member of the punk band. The duo recorded the sound of a cigarette being burnt into Drew Daniel’s skin by Don Bolles, former Germs drummer, and that sound source (heavily manipulated) formed the core of the song. But they allowed for extraneous sound sources – such as a synth sound – to be combined into the song, to benefit its composition. The duo played another song, from their upcoming album – which was totally composed from a single sound source (we will not reveal which source this was as not to spoil the surprise). 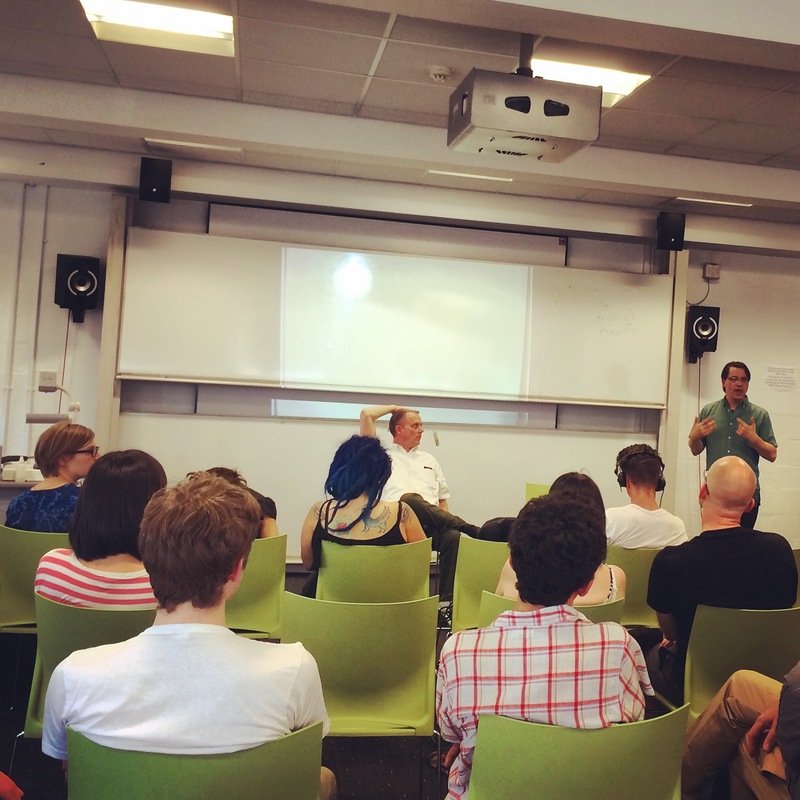 The talk switched between an academic tone and an irreverent and humorous one, which made for a very pleasant session in an unusually very warm day in London.